How did those people downloading anime get caught? The mrbrown show team investigates. This entry was posted Wednesday, September 5th, 2007 at 4:00 am and is filed under Audio, Matters of National Importance, the mrbrown show podcast, Podcast. You can leave a response, or trackback from your own site. I like the part of how “helpless” the ISP were. anyone care to explain the pic? Sequel No. 2 in making? Like to hear more on this. Great work on the analogy. Nicely done mrbrown! You are the best! This really does make light of the situation. What confuses me is even if they served the downloaders with a lawyer’s letter that asks for a settlement for the downloads, what’s to stop them from reporting the downloaders to the authorities, who’ll probably serve them with a fine again? odex didnt send any lawyer letters at all, the letter threatening lawsuit were from odex using their own company letterhead. if wat shin says is correct, then odex shud be sued for FRAUD! Hah, nice to see my pic on a mrbrown podcast. This is great! 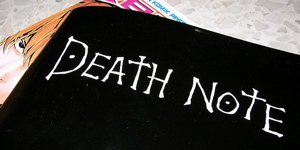 Really funny death note parody! But I thought starhub did put up a fight?? Can Kira write 127.0.0.1 in his notebook? dun insult death note..kira oni punish those who need to be punish hor..
odex has the worst subtitles i ever seen. they made the most obvious translations AND the unforgivable typo error.